Nkanyiso Mchunu is a South African actor best known for his recurring role as Justice in the SABC1 drama series Ingozi. 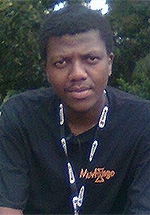 He previously had a recurring role as Sizwe on the SABC2 soapie Muvhango and guest starred as a policeman on the fourth season of the SABC2 sitcom Skwizas. Nkanyiso also had a cameo role on the SABC1 drama series Soul City, did a voice over for an ABSA commercial and acted in a television advert for MTN. In 2019 he joined the cast of the e.tv soapie Imbewu: The Seed as Nkululeko, a troubled and mysterious stranger on the run from a dangerous past life he wants to keep hidden. His first appearance was in the Season 1 finale which aired on 12 April, 2019 (Season 1, Episode 260).